This recipe makes a 7″/18cm cheesecake. 1 tub of Full fat or low fat cream cheese. 1 US cup measure of caster sugar. 150g small can of Manderine segements. Spare Chocolate orange segments or I bought the mini ones in the sharing bag. To make the cheesecake base – melt the butter in the microwave or in a small pan over a medium heat until fully melted. Crumb the biscuits in a food processor or I use a plastic zip lock bag and beat with the end of a rolling pin, add the biscuit to the butter, and mix until it is combined well. Place it into the cheesecake tin and press down firmly and chill in the refrigerator for at least half an hour. To make the cheesecake filling – Melt the chocolate orange in a bowl over a pan of gently simmering water, stirring gently or microwave gently checking and stirring until fully melted – leave to cool slightly whilst doing the rest. Next add 75ml of water to a pan and simmer. Whisk in the geletine powder until disolved. I also add the caster to this mix and stir to disolve and leave to cool. Whip the fresh cream and leave aside until you require it. I would then drain and chopped the Manderine segements and leave to drain further. If you find they are too juicy pat in the sieve with some kitchen paper. With an electric mixer, mix the cream cheese, vanilla and melted Chocolate Orange together until it is thick and moussey and well combined. At this stage I then drizzle in the sugar and geletine syrup whisking all the time with your electric hand mixer. The mixture will be quiet a runny consistency at this stage. Then fold in the whipped cream until well combined and lastly fold in the chopped Manderines. Gently pour the cheesecake mix into the biscuit base and leave to set for at least 6 hours or preferably overnight in the fridge. To decorate I meted some ornage chocolate and drizzled over the set cheesecake. 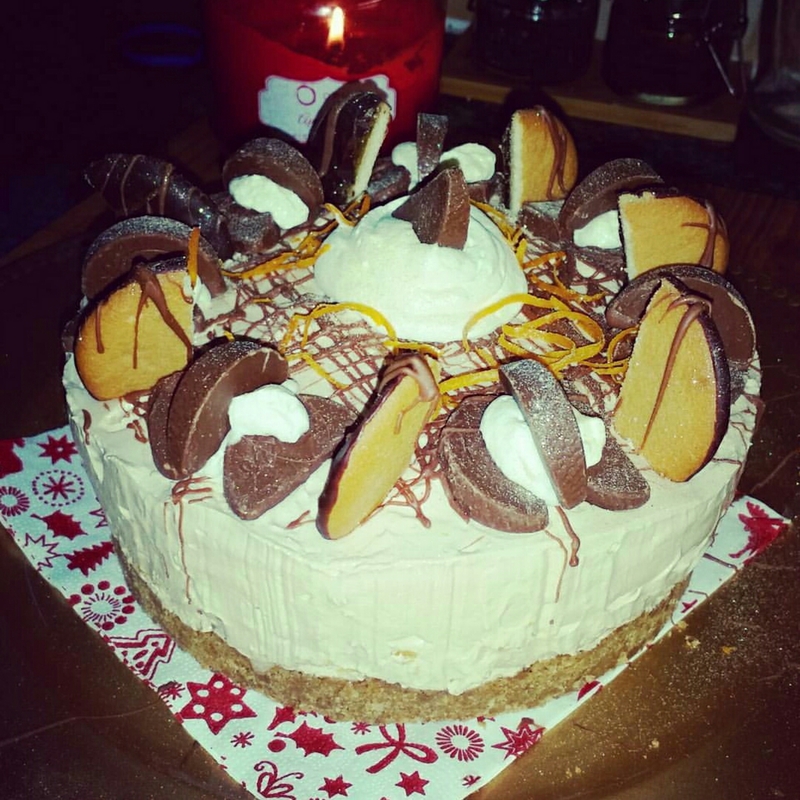 I added the mini orange segements, half moon jaffa cakes and whipped cream to the top and drizzled some extra melted Chocolate and dusted with edible glitter. Have a wonderful Christmas and a prosperous new year. Next Next post: Slow Cooker BBQ pulled Pork!